With the current G8 summit in Japan and environmental concerns on the front pages around the world right now, Sharp has chosen the perfect time to unveil its most eco-friendly television yet. The 26-inch LCD is actually on show at the summit in northern Japan, where it forms part of an environment showcase from the Osaka company. Sharp claims it uses just a quarter the power of a similarly sized CRT television. 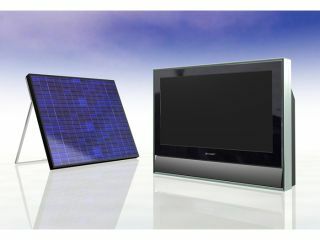 Sharp is also demonstrating a solar panel-powered version of the new set that is the same size as the TV screen. This obviously does away with the need for a mains connection. Although the pairing constitutes a prototype, Sharp suggests that it might find a market in areas where there simply is no electricity supply – a situation that currently affects 1.6 billion people worldwide.